A Happy Belated Mother's Day to all you mothers in the UK and in any other place in the world that celebrated Mothering Sunday yesterday. I hope you had a lovely day. I had a really wonderful time and felt very spoiled. My five year old daughter is so sweet. She chose her present for me all by herself. Apparently she had her heart set on getting me a vase to put flowers in. She dragged her daddy round lots of shops on Saturday and fell in love with a glass butterfly vase which she really wanted to get for me. I tried photographing it today but was really not happy with the shots I got so here is a close up of the beautiful tulips that are currently sitting in it. It's so cute when kids choose gifts for people. They always put so much thought into it. That's really sweet! 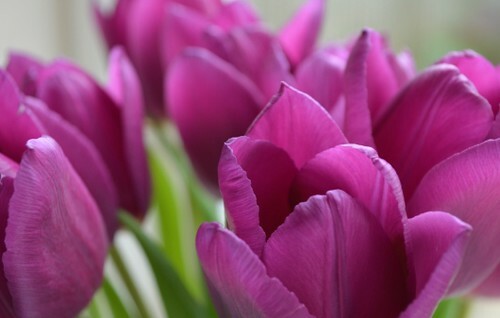 And those tulips are such a beautiful color. The tulips are still going strong too!